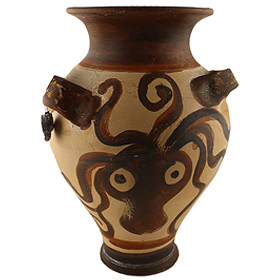 A beautiful handmade replica of an Octopus vase on display at the Heraklion Museum in Crete. The decoration is typical of the Minoan Marine Style which included pottery with detailed depictions of octopuses, Argonauts, starfish, triton shells, coral, and seaweed. The period of the actual vase at the museum is dated between 1700-1450 BC.